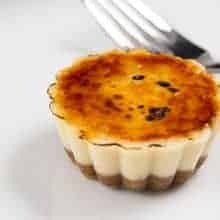 Impress your guests with these luxuriously rich & dense Instant Pot Cheesecake Creme Brulee Bites! Truly a delicious taste of heaven in one bite. Critical Tip: We highly recommend using a Hand Mixer to mix the cheesecake batter instead of a Stand Mixer. Stand Mixers are often more powerful, thus you can easily overmix and introduce too much air into the cheesecake batter. This may result in a puffy souffle-style cheesecake. 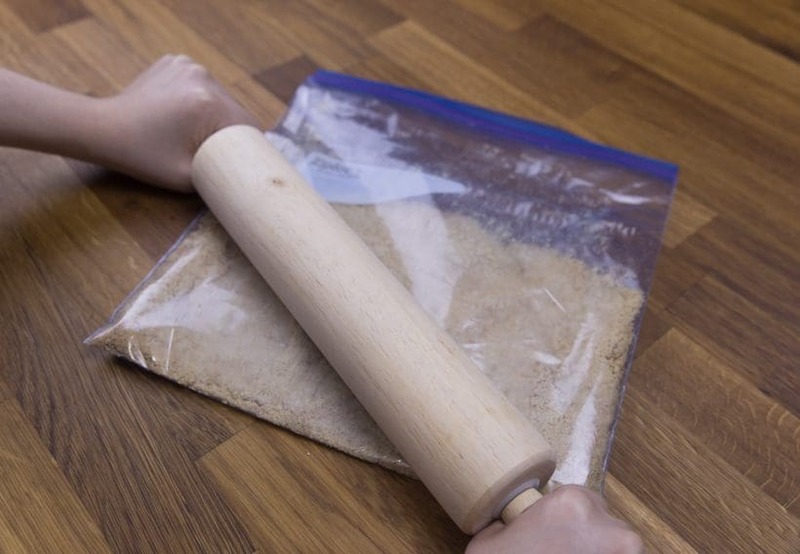 Make the Cheesecake Crust: Finely ground the graham crackers in a food processor or place the graham crackers in a Ziploc bag, then roll them with a rolling pin. In a small mixing bowl, mix finely ground graham crackers, a pinch of sea salt, and 2 tsp (8.3g) to 1.5 tbsp (19g) brown sugar together with a fork. Mix in ¼ cup (32g) all-purpose flour if you are blind-baking the crust. Mix in roughly 3 - 4 tbsp (42g - 56g) unsalted butter until the mixture sticks together. Place about 1 tbsp graham cracker crumbs into each silicone baking cups. Gently press down the crumbs with a spoon to form a nice, even layer. Place the baking cups in the freezer while making the cheesecake mixture (Skip this step if you are baking the crust in the oven). Optional - Blind-Bake the Cheesecake Crust: Place the baking cups in a 325°F oven for 12~15 minutes. Make the Cheesecake Mixture: Mix 2 tbsp (16g) cornstarch, a pinch of sea salt, and ⅔ cup (133g) white sugar together. In a medium mixing bowl, beat cream cheese over low speed with a hand mixer until creamy. Add in half of the sugar mixture and beat until incorporated using low speed. Scrape down the sides and the hand mixer with a silicone spatula every time a new ingredient is added. Add the remaining sugar mixture and beat until incorporated using low speed. Add ½ cup (120g) sour cream and 2 tsp (10ml) vanilla extract to the cream cheese mixture. Beat until incorporated using low speed. Blend in two eggs using low speed, one at a time. Mix well after adding each egg. Try not to overmix on this step. Scrape down the sides and the hand mixer with a silicone spatula and fold a few times to make sure everything is fully incorporated. Fill the baking cups to ⅔ full with cream cheese mixture. For Smooth Surface: Tap the baking cups against the counter a few times to let the air bubbles rise to the surface. Burst the air bubbles with a toothpick. Tap it a few more times until no air bubbles rise to the surface. Pressure Cook Cheesecake: Pour 1 cup (250 ml) of cold running tap water into the Instant Pot Pressure Cooker. Place the baking cups on top of a trivet that doesn’t touch the water. Close the lid and pressure cook at High Pressure for 7 minutes and Full Natural Release. The natural release will take roughly 7 minutes. Open the lid carefully. Cool the Cheesecake: Remove the baking cups from the Instant Pot Pressure Cooker and place them on a wire rack. After a few minutes, carefully run your thumb against the rim of the baking cups to avoid the cheesecake from sticking to the sides (see video). Chill the Cheesecake in the Fridge: Once the cheesecake baking cups have completely cooled, loosely cover them with aluminum foil. Then, place it in the refrigerator for at least 4 – 6 hours. Serve: Carefully remove the cheesecakes from the baking cups. Spread roughly 1 ½ - 2 tsp white sugar evenly on top of each cheesecake bite. Then, use a culinary torch to melt the sugar until it caramelizes evenly to form a hard crispy top. See Cooking Tips in post. Cooking time does not include inactive time.